When a person calls or comes to our showroom with the need of a new shower, there are many questions that come to mind in order to do a proper assessment. Is the current shower space adequate or does the current shower footprint need to be changed? Is the shower area going to be combined with a bathtub area as well? What is wrong with the current shower situation? Has the current shower area leaked and affected the home in any way? What are the shower features, materials and budget for the new shower? All these questions and more need to be considered in the initial consultation. The shower features, size and materials contribute to the final cost of the shower. Showers today can be merely utilitarian in nature or they can include special features like dry and steam heat, body jets, large rain shower heads, dry or mist heated air filtered system or aromatherapy with the essence of oils. The shower unit material options may be constructed of fiberglass, acrylic, cultured marble, solid surface materials such as Corian, ceramic tiles, manufactured quartz/stone tiles such as Silestone or Cambria, natural stone tiles as well as full slabs of manufactured quartz/stone or natural granite and marble. Another cost factor is the size, design and shape of the shower. Usually the smaller the shower area, the higher the square foot labor cost. Because contractors cut and fit tile around the floor, wall and ceiling edges, small bathroom spaces may be more intensive than larger showers, which may utilize more materials. Therefore, all the variables in the decision making of the shower e.g. 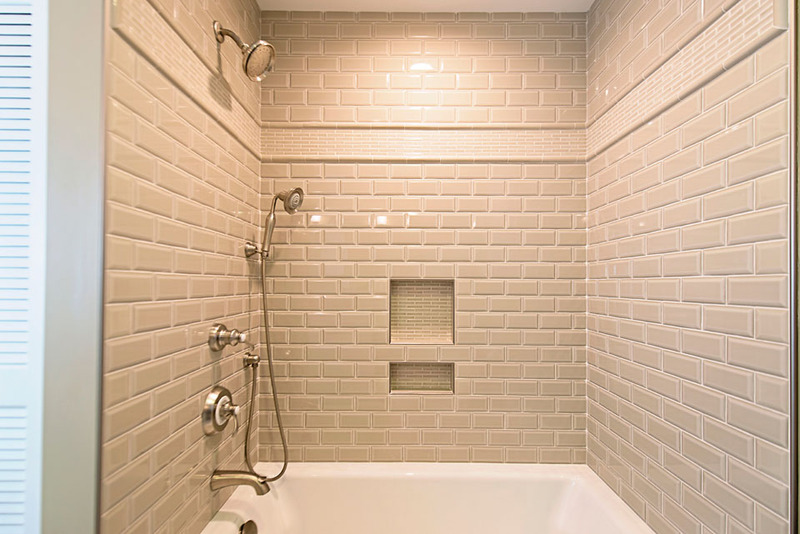 size, design, shower features and the types of materials will contribute to the bottom line cost of the shower. Shower heads with multiple settings that offer a variety of sprays have been around for several years. However, with the popularity of shower diverters, body jets, multiple shower heads will enable the bather to have their showering experience their way. Steam or dry heat permits the bather to sweat the toxins out of his or her body and aromatherapy uses the essence of oils for a therapeutic refreshing experience. (Some individuals claim health benefits.) Therapeutic colored lights and surround sound are also amenities that are very important for some. A seat in the shower becomes essential in order to relax and enjoy many of these amenities. As you can imagine, as one adds features to the shower area, they also add to the total bottom line of the shower cost. The original architect of the house generally determines the size of most bathroom shower areas. Changes to the original footprint must be thought through very carefully. The desire for the change must be balanced with the overall implications and cost of the changes. Generally any type of remodeling (e.g. as removal of walls, plumbing, HVAC, etc.) can be done, but is it worth the expense? The standard shower sizes are based on the size of the standard shower pans that are sized in widths of 32”, 36”, 42”, 48” and 60”. The standard shower pan sizes in depth are 32”, 36”, 42”, 48” and 60”. Generally, any combination of the width and depth are considered standard sizes. Custom showers are any sizes other than the standard sizes (e.g. 54” x 36”). The first number (54”) describes the width of the shower pan, and the second number (36”) describes the depth of the shower pan. The size of the shower is usually dependent on the size of the individuals that may utilize the shower as well as the necessity for the shower features (e.g. body sprays, etc.). If the shower area is too small, width or length, the shower area will prohibit a person from having the necessary room for using the shower with comfort. If on the other hand, the shower is too large an area, the heat from the shower water will escape through the open top of the shower and subject the bather to cold drafts on his or her legs. Large shower areas without a shower top will have the “chimney effect” allowing all the heat to escape. In warmer climates like Florida and California, the chimney effect is not applicable as the variance in temperature in the shower and surrounding area is usually closer together. Shower areas that have an enclosed top prevent the heat from escaping during the bathing process. However, with enclosed top showers, the heat and moisture are also retained long after bathing and thereby encourage mold and mildew to grow. The solution is to provide adequate exhaust ventilation that will draw the heat and moisture to the outside of the house. The cost of the material installation (labor and materials), the ease of maintenance and the aesthetics of the finished product usually contribute to the decision making process for the shower materials. Prefab fiberglass or acrylic shower units generally are the least expensive materials for a shower area. These units are generally mounted directly to the studded wall and need no cement backer board for installation. Usually one-piece shower units are appropriate only for new building construction because the units have to be installed prior to the erection of the walls. There are several manufacturers that have developed two, three or four section units that snap together for the remodeling installation. These units are usually seamless or are engineered that the seams required no caulk and are easily cleaned with non-abrasive cleaners. Cultured marble shower units are constructed of a manmade shower material that simulates natural stone and are the next most economical shower material. However, with cultured marble, these shower areas require the installation of a shower pan and cement backer boards to glue the cultured marble slabs to the wall. Most of the natural stone products must be sealed once or twice a year because they are porous stones by nature. Solid surface, quartz and natural stone slab are the last group of shower materials and generally are the most expensive. This type of shower materials require the installation of a shower pan and cement backer boards for the slabs to be glued to the walls. The advantage of slab materials is the same as with cultured marble in that the large panels are generally one-piece construction, seamed in the corners with an expandable caulk that will not mildew or leak. With solid surface and the quartz materials, these products can be cleaned easily with non-abrasive cleaners. Natural stone slabs have the same characteristics as the stone tiles because they are porous materials and certain shower cleaners cannot be used. Natural stone products should be sealed once or twice a year with specific stone sealers. There is a wide selection of colors and styles to choose from in the manufactured products (e.g. solid surface and quartz slabs) whereas natural stone is chosen for its unique veining and beauty. What gives value, beauty and ease of maintenance are in the mind of each person when remodeling a bathroom or shower area. In the selection of the shower materials, features and shower design all may be perceived quite differently from one person to another. What is expensive, beautiful and easily maintained may have different meaning for each person. However, there are certain overall guidelines to consider when remodeling your home (e.g. the cost of the home and the neighborhoods home prices). Certain home prices dictate the quality of materials that would be appropriate. The homeowner does not want to cheapen the home’s value or conversely overspend for the neighborhood. However, if the client intends to live in the home indefinitely, they may spend beyond the home’s value because resale is not a consideration.